Despite what the internet would have you believe, direct mail isn’t dead. Many B2C and B2B marketing activities are conducted digitally. It is a cost-effective marketing tactic. There’s no need for envelopes, stamps, and the nagging process of addressing envelopes. All you need is email marketing software and you can contact your entire database with the click of a button. However, this is exactly what gives direct mail it’s power: You can’t scroll past it in your crowded email inbox, deleting it before it’s even opened. In this article you’ll learn about the power direct mail holds for both your marketing and sales efforts. Let’s start at the beginning by looking at what direct mail marketing is. I know it may have been a while since you’ve licked an envelope or bought stamps. (You do remember stamps, right?) But utilizing a postal service, United States Postal Service (USPS), FedEx, or UPS, is what defines direct mail marketing. Direct mail is papers, postcards, or other items, such as a company’s promotional products, sent via the postal service to an individual’s home or business. The letters or parcels are sent for marketing purposes. They contain marketing or advertising messages and are designed to increase sales, get new customers, or maintain current customers. Bills are not a form of direct mail. Direct mail is a type of outbound marketing. The reverse, inbound marketing, means that customers are coming to you. An example of inbound marketing is blog posts targeted toward search engine optimization (SEO) and the use of keywords. 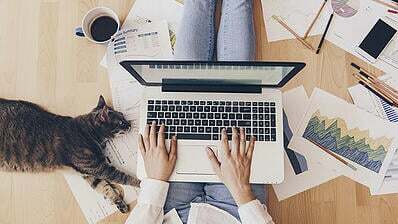 These blog posts are written with the goal of people finding them when searching for specific words and phrases on the internet. Direct mail is the perfect example of the opposite: outbound marketing. In this form of marketing, you’re taking your marketing message and delivering it directly into your customers’ laps. Direct mail can also be a type of advertising. Consider the fact that television commercials are advertising. This advertising is a marketing tactic. While an advertising agency wrote the script and executed the commercial, who hired them? That’s right -- marketers! The same applies to direct mail. It is often executed by a marketing team, but it can be a form of advertising. This is especially true when the mail is sent to prospects who have never interacted with your company before. So, we’ve covered the fact that direct mail works because you stand out. When you want your message to be seen, you have far less competition in an actual mailbox than an email inbox. We’ll look at the additional benefits of direct mail marketing in a moment. You’ve dealt with the obligation of reciprocation yourself plenty of times. For example, have you ever found yourself in this situation? Aside from social situations, reciprocation is also used in marketing. Think of the free samples handed out in mall food courts. Those brands don’t do it out of the kindness of their hearts! Reciprocity works so well it could almost be considered a marketer’s secret weapon. And, just like all those superhero movies, let’s hope marketers use the power of reciprocity for good. Because, the truth is, reciprocity works on everyone -- even doctors. A group of researchers studied the prescription habits of 279,669 doctors. 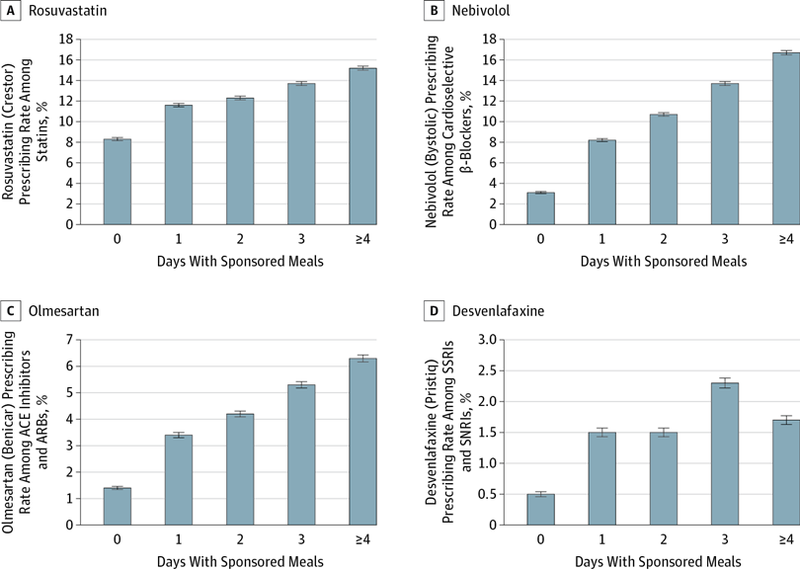 Their study measured how much a free meal from a pharmaceutical representative impacted the likelihood of the doctor prescribing that medication. At the end of their study, they found that even an inexpensive meal, less than $20, resulted in the doctor prescribing more brand-name medications. If even doctors fall under the spell of reciprocation, what hope do the rest of us have? That free lunch got results because people feel indebted to the person who bought their free meal. Instead of this negative feeling of indebted, you can use direct mail to create a positive emotion: gratitude. Take it from Dr. Gary Meyer, the Senior Vice-Provost for Faculty Affairs at Marquette University. The former Associate Dean, Diederich College of Communication, Dr. Meyer is an expert when it comes to understanding why people do what they do. Not only that, he worked with Cialdini himself writing the Influence workbook. According to Dr. Meyer, one reason direct mail recipients reciprocate is gratitude. In his words, “We are so grateful to someone for doing something nice for us, that we want to do something for them.” This feeling of gratefulness is a more positive emotion (and more ethical!) than that negative feeling of owing someone. Direct mail marketing is the perfect opportunity to put this principle into action. Whether your goal is to increase sales as a B2C marketer or help your sales representatives book meetings in B2B marketing, aim to send potential customers something of value. That value doesn’t have to be tangible. Throughout this page, you’ll see plenty of examples of gifts and promotional items being used in direct mail. Even if your budget doesn’t allow sending an expensive gift, you can use the principle of reciprocation to ensure your direct mail gets read and not trashed. For example, in Cialdini’s Principles of Ethical Influence, he advises being the first to give service or information. This ties back to a basic principle of marketing: make your campaign about the customer’s wants, not yours. So, even at those times you don’t have a big budget, direct mail marketing still works! Even sending just a small gift will come back to you exponentially. To get a better understanding of direct mail marketing, let’s take a look at some of the most common forms of it. You will recognize plenty of these from your own mailbox! 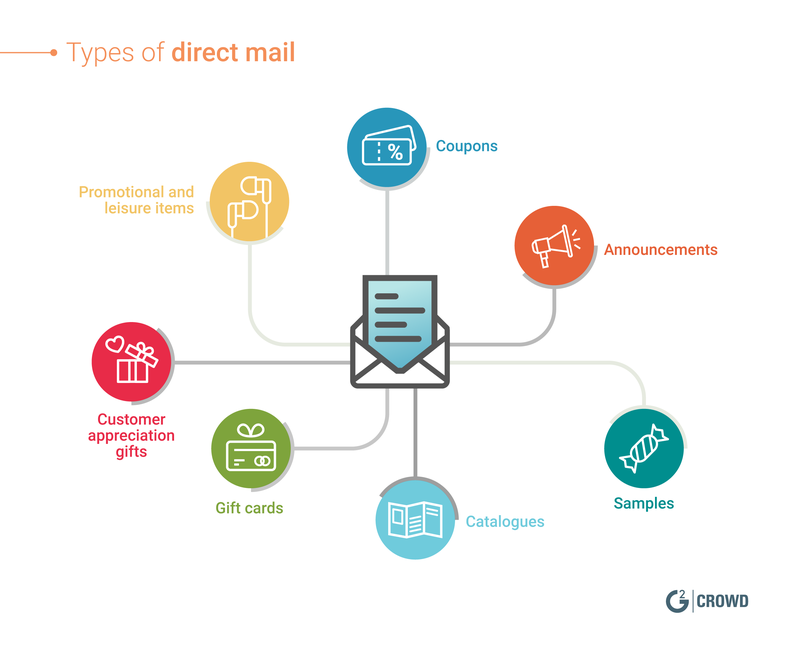 Here, you can see an overview of the types of direct mail we’ll look at. As we look at these forms of direct mail, consider which you keep versus toss when emptying your own mailbox. In addition, keep in mind that this is not an extensive list. If it’s sent to customers and prospects in the mail, and it’s not a bill, there’s a good chance that it’s direct mail! Coupons are one of the most effective forms of direct mail marketing. In fact, 87 percent of customers who redeem coupons do so with the printed version. When you send individuals a coupon, you’re giving them a reason to check out your store, either in-person or online. And, if your discount is especially enticing, you’re appealing to shopaholics like myself! If you’ve given your address to Bed Bath & Beyond even once, there’s a good chance that you’ve received one of these! Below you can see another example of a postcard recently received at my household. 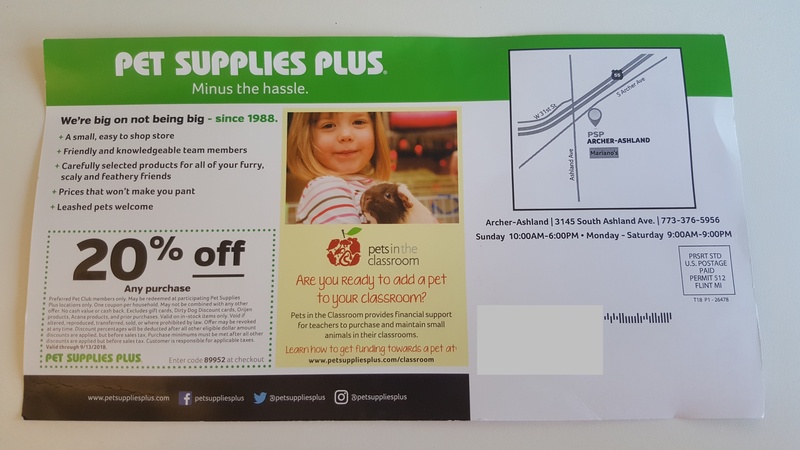 In addition to the discount coupon, the postcard also has information on their history, selling points as to why you should go to the store (leashed pets are always a plus! ), their social media handles, and a community initiative. Notice that they also included a map. This makes it easy for people (like me!) who have a hard time visualizing a store’s location from an address alone. Coupons are a form of direct mail with a direct impact on your bottom line. They get people buying your product, and that’s the whole goal of direct mail marketing! Aside from coupons, there are plenty of other marketing messages sent on printed paper. These are made up of different types of announcements. You might be sharing news, alerting your customers about an event or telling them about an upcoming promotion, but, in each case, you’re sharing information with your database. Say a local pet store is practicing event marketing by hosting a day with free dog pictures, competitions, and discounts. Sending a postcard to neighborhood residents announcing the event is a perfect way to increase attendance. And, to further increase the results of this direct marketing campaign, pet owners can be invited to bring in that postcard to redeem a free treat for their furry family members. Your announcement could be sent in the form of a postcard or a flyer with an eye-catching design. When you have a high-quality product, the best way to show off the value is by letting consumers try it for themselves. By sending free samples, you are reducing the risk buyers feel when purchasing your product. No one wants to face buyer’s remorse as they realize they’ve wasted their money! If someone is on the fence about your product, wondering if whether or not your product lives up to the marketing claims on the packaging, give them a sample. This is what could push them over the edge to purchasing. And, if your sample includes a limited-time coupon, you are even more likely to increase sales. For example, I am a huge fan of skin care, so I’m a regular customer of Dermstore. Dermstore sent me a sample that was thin, keeping mailing costs down. (The more width, or thickness, your mail has, the higher your cost will be.) The sample is from Skinceuticals, a brand I’ve previously bought from Dermstore. I have to think that’s not a coincidence! There is an offer for 20 percent off that runs for a limited time. Both of these increase the likelihood of my purchase, especially if I like the sample they sent. In addition, there is a custom coupon code. 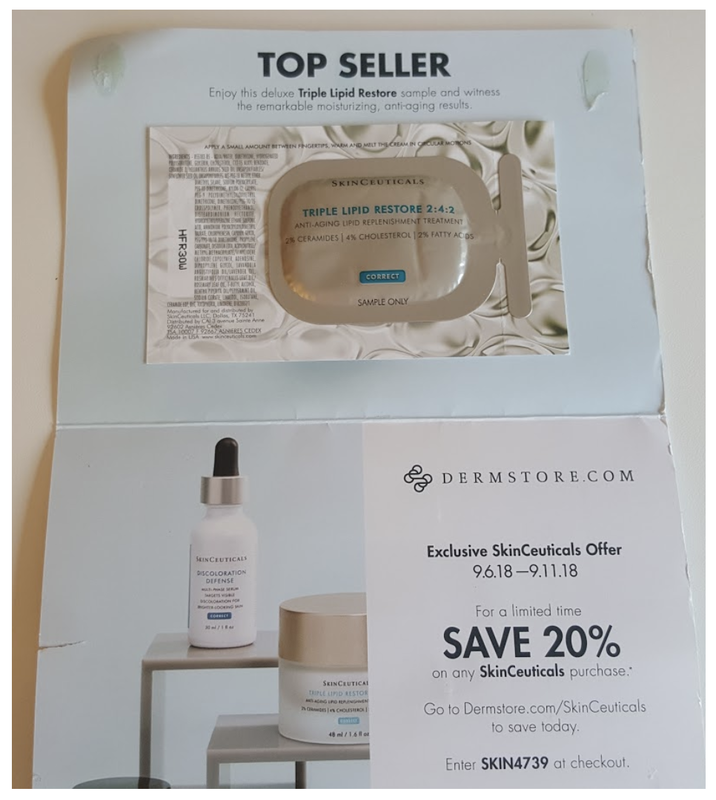 This enables Dermstore to track what purchases were made as a result of this direct mail campaign. My current household doesn’t receive many catalogs, but my parents’ does, and I still love looking through them. And guess what – I’m not alone! When’s the last time you had a 42 percent open rate on a bulk email sent out? And, regardless of open rates, very few emails get more than a quick scan before hitting the delete button. Not only are people reading catalogs, they’re buying from them. In 2016, over 100.7 million American adults made a catalog purchase. Okay, I’ll admit it. You can buy anything and everything on the internet, but doesn’t that get a tad overwhelming when looking for that perfect gift? And, with all of those websites to search on the internet, it’s reasonable to assume you won’t always appear on the top of those Google search results. How can you make sure customers go to you and not their competitors? The answer is – you guessed it! – catalogs. This is the advantage of outbound marketing. You can’t always count on consumers finding you, and direct mail does the search work for them. Catalogs also give tired eyes a break from staring at screens. Sure, there’s a good chance customers will find products in the catalog and go online to complete their purchases, but the catalog is what’s improving your bottom line. Who doesn’t want a higher response rate? The value of the item you send will vary between B2B and B2C companies. 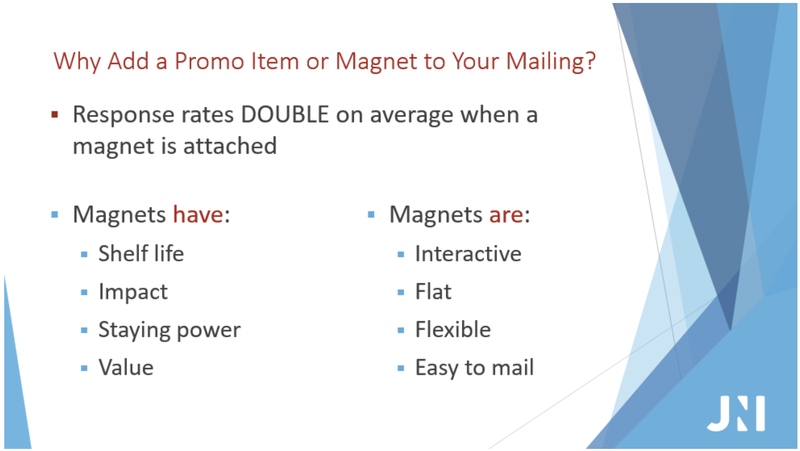 If using a magnet in your direct mail, find a way to make its design something your target market will want to see on a regular basis. For example, as a Wisconsin girl, my Mom and I go nuts for magnets that have the Green Bay Packers’ schedule on them. (Yes, I live in Chicago now -- my apologies Bears fans, please don’t hate me!) Consider sporting schedules for your audience’s teams or a message that is funny or inspirational. Then, add your logo, but make sure it doesn’t take over the entire magnet! The cost of B2B products and services are substantial, so B2B marketers send promotional items with a higher value. If you’re at a B2B company, it’s a story you are no doubt familiar with: You’re working with long selling cycles, and it takes time and multiple touchpoints to get that purchase made. In addition, those selling B2B products and services have to deal with multiple decision makers to cross the line and close that sale. When leading prospects through the sales and marketing funnel, you’re hoping they’ll invest a pretty penny with you. So, it takes more than a magnet to get their attention. 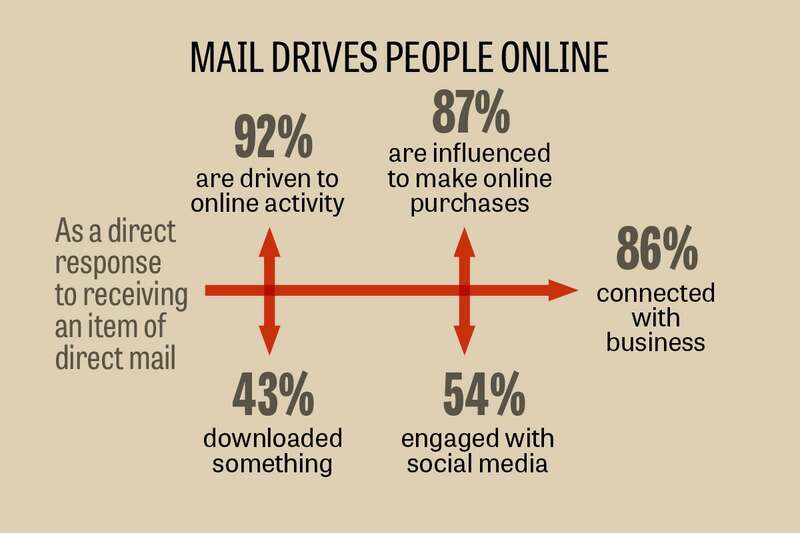 This is why direct mail is especially effective as an account-based marketing tactic. A great way to help your sales team book that first meeting is by sending a personally addressed item that will grab the attention of decision makers. While you can send swag, spend some time looking at non-branded options as well. If you’re targeting enterprise companies, this is where you may find the best results. No branding means that it really is all about the customer and their enjoyment. You’re also able to focus on a marketing message that puts the needs of your customers first. 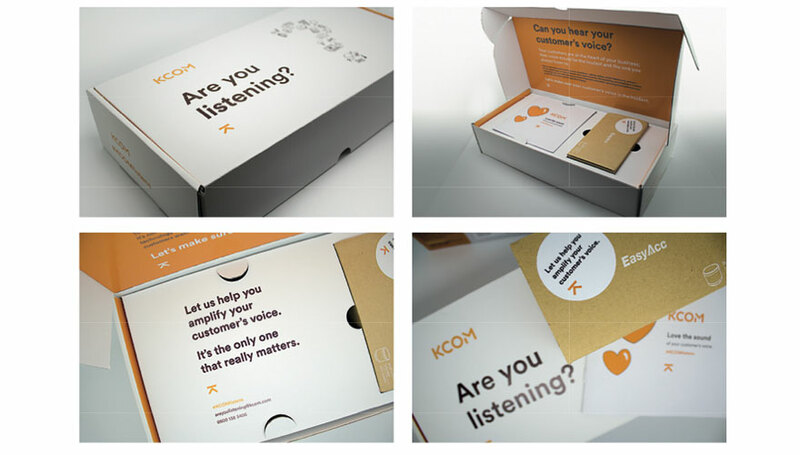 For an example, let’s look at a campaign by U.K. telecommunications brand KCOM. After bringing together its subsidiary brands in 2016, KCOM was working as a unified single brand targeting enterprise companies. To get noticed by the big players in its industry, the company focused on a problem it could help these large companies solve: getting through any potential missteps in digital transformation to become more customer-centric and agile. With an investment of £22,270 for 500 boxes, the company booked introductory meetings with 25 percent of the companies and built a pipeline of 15.7 million £. How’s that for return on investment (ROI)?! The opportunity to send gifts doesn’t end when an individual becomes your customer. In fact, considering the positive impact that customer lifetime value has on your bottom line, this might just be the most important time to start packing those parcels! Sending your customers a gift, however big or small, is a great way to show your appreciation. It also goes a long way toward building and maintaining relationships. Another time to send customer appreciation gifts is at a client’s yearly anniversary of working with your company. This shows that you still value your clients. It also provides another touch point with your clients, ensuring you stay at the top of their mind -- and you do it in a very good way! And it never hurts to get those positive vibes out there before it’s time for contract renewals. It’s not just cards that get sent at Christmas. Customer gifts are often sent out as the holidays approach each year. My father is a salesman, and I have fond memories of helping him deliver calendars to his clients each year. Some of the gifts I’ve personally received include high-end edible goodies, and, one of my favorites, a holiday season survival kit. As long as your gift serves a purpose (it can be used, eaten, or worn? ), people will appreciate it. Just make sure it is an actual gift. If an item’s only function is showing off your company logo, it’s not a gift, and your parcel will have the opposite result you intended. This will drive that “gift” straight into the trash can with the other junk mail! No matter the cost, all customer appreciation gifts should include a personalized note. In B2B companies, this is written by the account manager who best knows the client. The note is where your gift’s true value is found. You haven’t just spent some of your marketing dollars on them, you’ve also shared your time. In addition, appreciation gifts should not be about upselling. Imagine taking your niece or nephew shopping to pick out a very special birthday gift. Wanting to spoil them, you spend more than was necessary. You also take them to a candy shop, ensuring a nice sugar high before handing the child back to mom and dad. A few days later, you receive a handwritten card in the mail, written by your niece. She starts off thanking you for the special day. Then, she goes on to say that next time, instead of one Barbie, she’d really rather have two, as well as that My Little Pony set found in the next aisle. Unlike the candy shop, this card doesn’t leave a good taste in your mouth, does it? For a gift to be a true thank you gift, that is the only function it can serve: saying thanks. Sure, you can include your branding on the packaging and the stationary, and you might even send company swag. But the message must be truly customer-centric. Gift cards provide the value of gifts and promotional items without the cost. You’re sending your target market something they want (no one thinks a gift card is junk mail!) without the bulky mailing costs. When you’re ready to purchase your gift cards, there are a few routes you can take. If you’re starting small, you can buy your gift cards at a store or online, the same way you would if buying just one. If you’re buying your gift cards online, make sure you get that actual plastic gift card! It looks much more professional than a printed piece of paper. Without it, your recipient will miss out on that element of excitement. Gift card companies (yes, there are actual gift card companies!) enable you to both buy and brand your gift cards. GiftCards.com, for example, allows you to put your company logo or product on the card when meeting a minimum yearly spend. For orders over $10,000, you can upload your own custom design and get additional support from an account manager. It’s worth noting these custom gift cards take more time to set up. They do, however, better serve your purpose. Once a prospect puts your gift card in their wallet, you want them to remember it was from you! One of the biggest benefits of direct mail is that it stands out more than email. There are plenty of additional positives that make direct mail marketing an excellent strategy. But, where there are positives, there are also negatives -- there’s a reason not all marketers use direct mail! Let’s consider the pros and cons of this marketing strategy. We’ve touched on one of the biggest benefits of direct mail marketing -- it stands out. How many emails do you get a day, and how many pieces of snail mail? It’s not hard to guess which channel is more cluttered! Now, let’s consider four additional benefits of direct mail marketing. Direct mail is tangible. It’s a physical item people open up and see. Not only do they open it, but recipients actually read and respond to direct mail. Then, best of all, it results in purchases! A simple look at your marketing analytics software will reveal how these statistics compare with digital marketing. The average email open rate across all small and medium businesses in the U.K. is 24.79 percent. With a direct mail open rate of 66 percent, you don’t need much mental math to know that snail mail’s open rate is more than double! Direct mail gets opened and read because it’s tangible. If you’re like me, there are plenty of starred emails in my inbox I want to go back and read. But, as new emails come in, those stars continue to shift lower and lower in my inbox. Often, I suddenly find my inbox overflowing, and I need to start deleting. These emails, with information I genuinely want to read, never get opened. On the other hand, if there’s physical mail I want to read, I keep it right in front of me where it can’t be missed. (My husband even keeps it on the kitchen counter so we have to read it or get food all over it while cutting our vegetables!) The bi-weekly coupon from our local grocery store goes up on the bulletin board, safe and sound where it won’t be lost. Not only do we remember to use that coupon, the store’s branding has a place of prominence in our house. Many people’s purchasing decisions are influenced by direct mail. 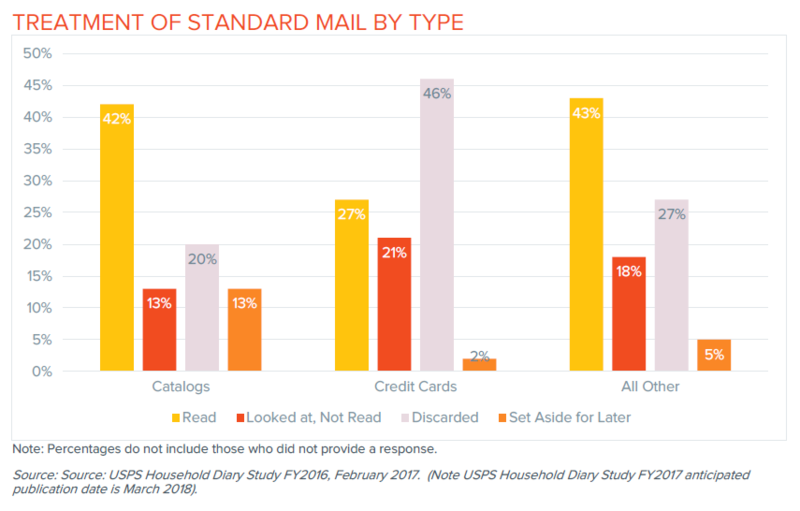 As noted in the image above, 62 percent of consumers who responded to direct mail in the past six months made a purchase. Earlier, we looked at the time individuals spend reading catalogs. The great news? People don’t just read catalogues, they take action from them. According to The Agency Ltd, 25 percent of all print catalogues received in the last six months triggered a website visit, and 33 percent triggered a visit to a retail store. Individuals are actively engaging with direct mail. Direct mail doesn’t just support sales, it helps you meet additional marketing key performance indicators (KPIs). Take website traffic, for example. When you send someone a catalogue with items they want to buy or a discount that pushes them over the edge of the buyer’s journey from consideration to purchase, where do they go to take action? That’s right -- your website. In fact, according to Marketing Week, 92 percent of people have been driven to online activity as a result of direct mail. Knowing this, you can design a call-to-action (CTA) that encourages your direct mail recipients to go to your website. This one may come as a shock. When I say people want to read direct mail, I’m not just talking about your grandparents. Millenials want direct mail too. A 2016 study by USPS found that millennials are at least as engaged with direct mail as those in other age groups. 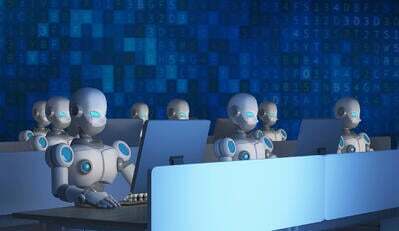 Plus, 50 percent of them look forward to checking the mail, and millennials spend an average of nine minutes per day sorting the mail; an average higher than any other generation. If you’re worried your direct mail marketing efforts won’t work on younger audiences, you need not fear. These are only a few of the many statistics supporting direct mail as part of your marketing campaign. In case you haven’t figured it out, the biggest benefit of direct mail marketing is the fact that it works! There are two immediate negatives to direct mail marketing -- time and money. We never have enough of them, in work or life! Marketing software enables businesses to send marketing materials to a large audience quickly and at a low cost. With email marketing and social media software, you could win an award and share the news with your customers that very same day. Direct mail takes more time -- you can’t go any faster than USPS allows! Aside from the time it takes for customers to actually receive your message, direct mail also requires lead time to get that mail sent. You need to get the materials printed, and the envelopes signed, sealed, and delivered. Let’s not forget how much of your day that process will take up, either! Budgeting is another factor in direct mail marketing. At the very least, you will require a printed postcard and stamp. If mailing promotional items (more about that in a moment!) 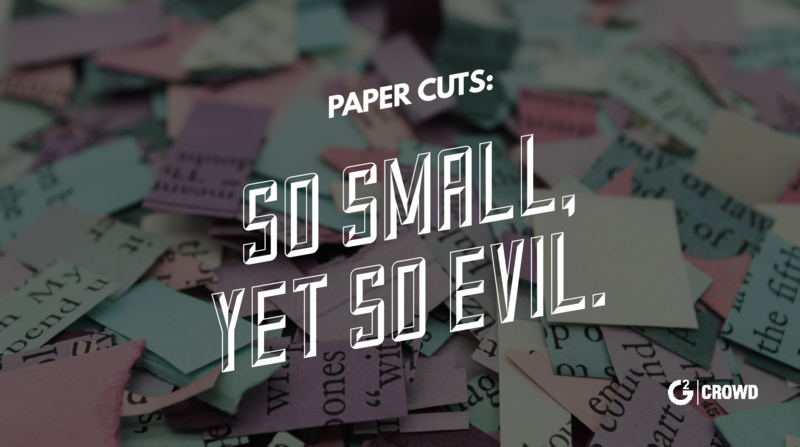 instead of just paper, your costs increase dramatically. Not only do you have to pay for the promotional materials, you also need to pay increased shipping costs and spend more on those shipping materials. Padded mailers and cardboard boxes cost more than your standard A3 envelope, and let’s not forget about packing tape! These costs can make direct mail feel risky. If you send an email to your database, and it doesn’t get results, the most you’ll lose is a few email subscribers. You’ve already paid for your email marketing platform, so your marketing budget hasn’t really taken a hit. With direct mail, that’s not the case. But, you know what they say: No risk, no reward. While direct mail does require investing your time and money, the benefits are worth it. When conducted with the proper strategic approach, direct mail marketing has a definite impact on ROI. The concept of direct mail is pretty simple when you get down to it. It’s a process anyone can execute. Before email and free job boards, young professionals would seek jobs by mass mailing their resumes. 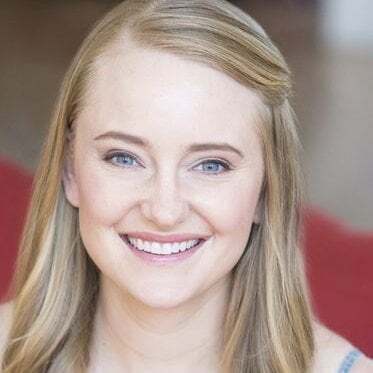 Every actor I know has executed a direct mail campaign in an attempt to get an audition for an agent or casting director. Now that you know the benefits of direct mail marketing, let’s look at how you can execute the strategy. Here are seven steps for you, as a marketer, to execute your direct mail marketing campaign. Before you get busy buying all those envelopes on Amazon, consider who is going to receive them. Segment your campaign recipients based on their demographics. There’s a good chance you already have a database with plenty of customer information. Now it’s time to put it to work! If you’re spending significant dollars on each recipient, you need to do all you can to ensure those recipients are likely to buy your product. Your target audience is already made up of specific demographics, such as age, gender, income, and location. For example, the target market for the female fashion brand Forever 21 would be millennial females who care about fashion and want budget friendly purchases. A retirement community would not be the ideal recipients for Forever 21’s direct mail! Make sure you consider your demographics when executing your direct mail campaign and target recipients appropriately. Sometimes targeting your campaign means time spent on research. If you are sending a B2B direct mail campaign for a product that costs thousands (if not hundreds of thousands!) of dollars, you want to make sure your parcel reaches the company decision makers. This requires you or your sales team to find out who these executives are and address your mail accordingly. You’ll also need to ensure that all addresses are up-to-date. 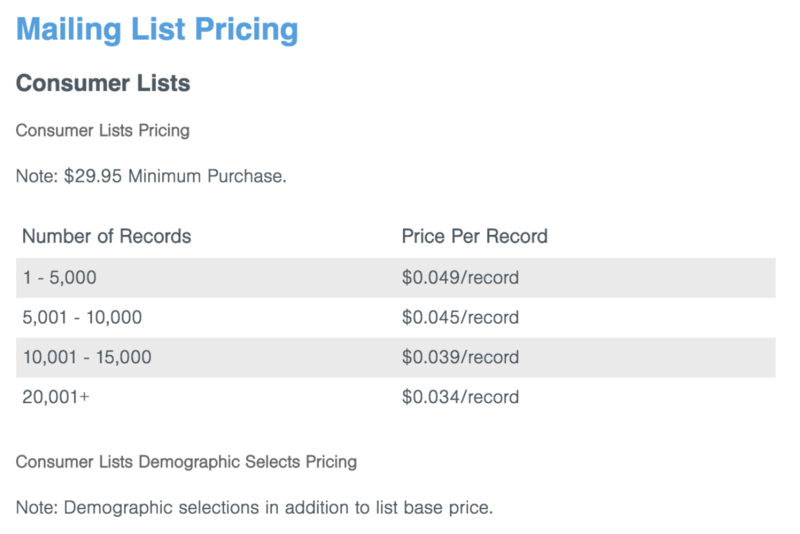 You may be a B2B company with a list of prospects in your database. If you already know your direct mail recipients, check the accuracy of those addresses in your customer relationship management platform (or CRM software, meaning your database), then move on to step No. 3. If not, and you need a list of recipients to send your direct mail, it’s time to purchase a direct mail list. Direct mail lists are lists of recipients that you purchase. Note that this does increase the cost of your direct mail marketing campaign. Similar to cold-calling, this direct mail will provide the first touch point for potential customers to discover your brand. You can either rent or buy your direct mail list. When you buy a list, you can use it as many times as you want. The downside? You are also responsible to maintain the list. Most companies choose to rent mailing lists; it is cheaper and less of a commitment. If you’re just dipping your toes into the world of direct mail marketing, this is the route to go. There are two types of direct mail lists you can purchase; compiled lists and response lists. Let's take a look at them both. Compiled lists are also known as “cold lists.” These are made up of recipients from a variety of sources, such as directories, phone books, warranties, surveys, magazine subscriptions, events, and even court records! While a compiled list is cheaper, the recipients are more likely to consider your unsolicited items as junk mail. (To put it bluntly!) They are, however, usually made up of people who have similar interests. For example, those who like crafts or knitting could be found on a compiled list. Response lists are made up of people who have opted in to receiving direct mail, They have given permission for their details to be shared with businesses. Individuals on these lists have purchased or gotten in touch with companies similar to yours as a result of direct mail. Response rates tend to be higher, making this type of list more expensive. The cost for direct mail lists vary based on the recipient. A list of business recipients costs more than a list of consumers. This is because businesses often spend more than individual households and a business address allows you to reach more people. This is just one example of many mailing list providers. If you’re going this route, it pays to do some research and compare how targeted the lists are. When comparing prices, remember the statement, “you get what you pay for.” (It exists for a reason!) Cheaper lists may be lower quality. For example, the demographics may not be as specific as you hope, resulting in a lower response rate. If you don’t have a database of prospects and you’re sending postcards, consider utilizing USPS Every Door Direct Mail, or EDDM. Not sure what that is? Here's an EDDM article with the basics! 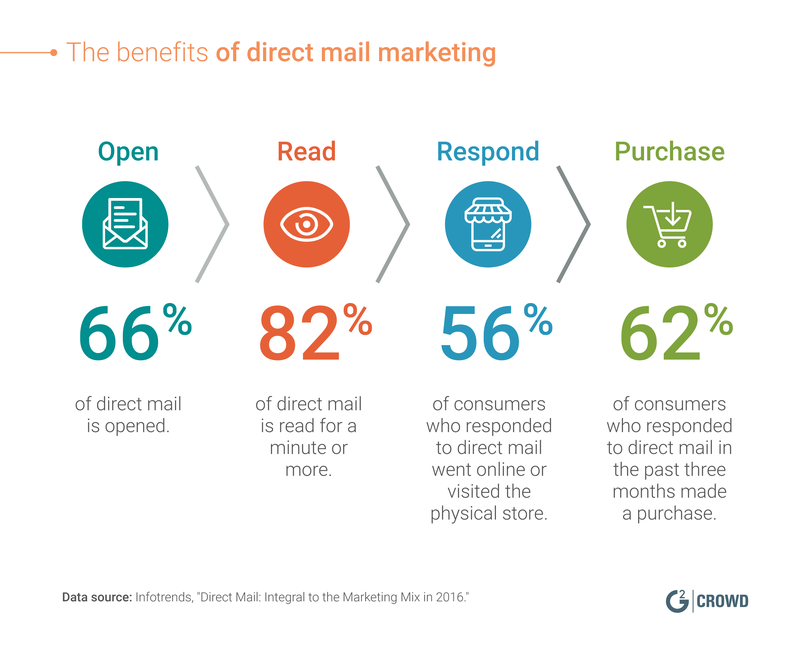 Yes, direct mail is more likely to get opened and read than other forms of marketing. But prospects reading mail doesn’t do much to your ROI, does it? This is why you need a strong CTA. You’ve already done the work of segmenting your direct mail recipients. It’s time to focus on what you want those recipients to do. Whether you want people to register for an event, set a meeting with your sales team, or go to your website, spell out exactly what mail recipients should do. Here you can see an example of a strong CTA on mail I received from Hello Fresh. 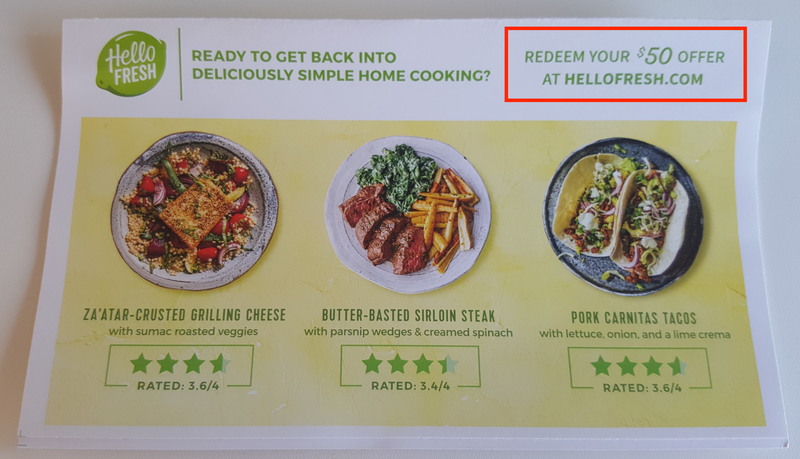 Then, the mail encourages me to take action: “Redeem your $50 offer at hellofresh.com”. Don’t forget to proofread your direct mail copy! If you make a mistake on your website, it’s easy to go in and update your text. Sadly, the same can’t be said for direct mail! The last thing you want is 1,000 postcards printed with a typo. Take the time to edit, and ask a coworker if they’re willing to give your copy a once-over too. A second set of eyes never hurts in the publishing process! Now that you’ve got the who and the words, it’s time for the what. If your direct mail campaign depends on a letter or postcard, your design is critical. You only have to engage the recipient before your mail is tossed aside, never to be seen again. Start with a strong message that makes the recipient curious to find out more. You can even put your message on the envelope, encouraging the recipient to open the mail. Depending on the size of your company, you may have a graphic design team or supplier you already work with. 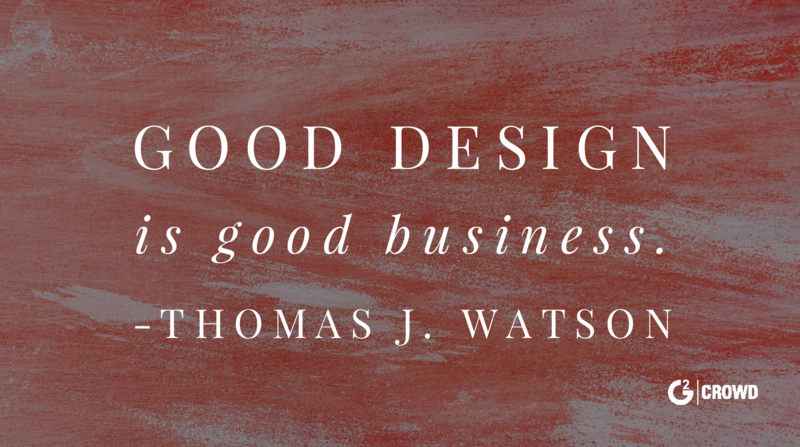 If not, the internet is full of design software providers with free templates. In addition, online printers selling postcards have plenty of designs you can customize. If you’re mailing a physical item, you’ll need to purchase your shipping materials. Boxes or bubble mailers, labels, and packing tape all add up. I like to think of this step as a digital treasure hunt where I scour the internet seeking out the best deals. There are some companies that sell bubble mailers at massive discounts, compared to bulk rates you’ll find on Amazon. Paper Mart is one of my favorite companies for these supplies. If you want to build excitement the moment your package arrives, consider custom boxes with your company colors or logo. This will help ensure the item is associated with your company. When shipping these promotional items, don’t forget to include an insert with your contact information and a CTA. This is another item that you’ll have to design and print. So, you’ve ordered your promotional items, boxes, bubble wrap, and printed inserts. Given this is direct mail, I’m going to take a chance and assume you bought in bulk. This means you probably won’t have the same amount of each item. If you’re sending your items on a regular basis, you need to maintain inventory of not just the items you’re mailing, but those packing materials too. You don’t want to have your assembly line set up, ready to seal and stick on address labels, only to find you’re 25 boxes short! When conducting ongoing direct mail campaigns, you also need to maintain inventory of the items you’re shipping. Say you’re missing 10 sets of earbuds. Sure, you can still send those when they’re back in stock. However, you now have those 10 recipients hanging over your head. 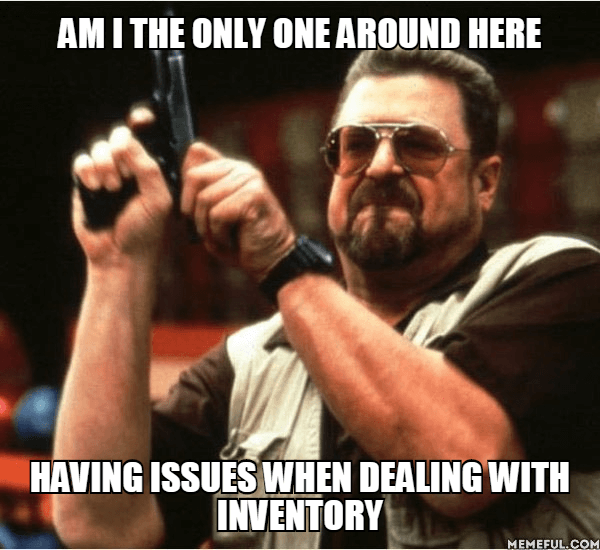 Make sure you keep track of your inventory on a regular basis; it will save you headaches (and rush shipping charges!) in the long run. Here’s the part where you get the items from the printer (or you office!) to the homes and offices of your recipients. While commercial mailing rates sound great in theory, there are multiple steps in the process you need to consider. If you’re just getting started with direct mail, and you’re sending 50 parcels or less, consider sending the items yourself. Given it’s just like sending your niece a birthday present, you’ll save yourself the headache of the somewhat technical process of USPS direct mail. Alternatively, when investing substantial dollars in your campaign, it’s worth considering direct mail services. There are agencies, automated direct mail software, and companies dedicated to direct mail solutions ready to assist you. If you’re packing and shipping your own direct mail, get that assembly line ready! Whether you’re taping labels onto boxes or stuffing, sealing, and stamping envelopes this stage involves some manual work. Just look out for those nasty paper cuts! Put on some music or a podcast, and see if any co-workers are willing to help you out. Many hands make the work go faster, and you might be able to do some co-worker bonding! Once you send your direct mail campaign, it’s time to measure the results. When executing direct mail marketing, you should always find a way to track the results. If you’re driving traffic to your website, create custom URLs to be used in your direct mail advertising. If providing a coupon, use a promo code that is unique to each campaign. Then, after you’ve sent your mail, you can track which purchases, website traffic, or sales meetings are a result of your direct mail strategy. If direct mail is a continual part of your marketing efforts, continually test and refine your campaign. Experiment with your recipient demographics, the items you send, or your CTA. By tracking direct mail marketing effectiveness, you’ll ensure your response rates keep climbing higher and higher. And, as a result, hopefully your ROI will too. Your company’s c-suite is sure to be pleased when you can prove you had a direct impact on profits. Yes, we live in a digital age. Yes, email and social media are effective tools. But you can’t ignore the impact of direct mail. 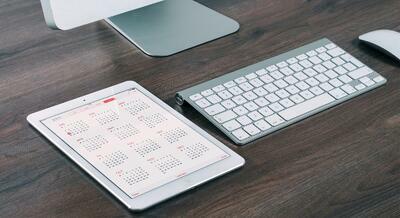 No matter your budget, all marketers have an email marketing strategy. This makes for crowded inboxes and plenty of unsubscribing. The same cannot be said of snail mail. Taking the time to invest in direct mail is how you’ll stand out from your competitors. Now that you know the benefits of direct mail marketing and how to execute a campaign, it’s time to start brainstorming! Like experiential marketing, direct mail is the perfect opportunity to get creative and have some fun. 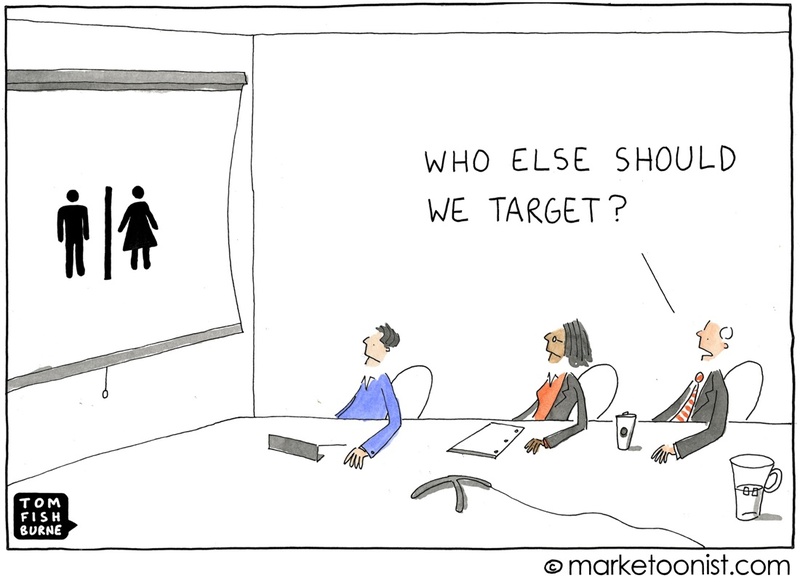 What customers do you want to target, and what budget do you have? How can you use direct mail to surprise and delight your prospects? Remember to keep track of your process and where you see the best results. This will enable you to speed up execution on your next direct mail advertising campaign. Whenever you’re in doubt, ask yourself: Does this mail provide value to the recipient? You don’t just want your mail opened, you want it to serve your marketing goals. The biggest hurdle to overcome in direct mail is the garbage can. You want to to end up on someone’s desk or fridge, and I have faith in you. You can overcome that junk mail connotation! With a little strategic thinking, even a budget-friendly postcard can earn you a prime position front and center on a customer’s fridge.